Induction cooking is a highly efficient and technologically advanced way to prepare meals. It is used by top chefs and families alike, and with its recent rise in popularity, this style of cooking may soon outrun the gas range and claim the title of “World’s Best Cooking Method.” However, induction stoves don’t work with just any cookware. Induction cookware is specially developed to work with induction stoves and bring you the perfectly cooked, evenly heated goodness that only a magnet can deliver. You read that right; magnets are now preparing our food. Here you will learn about how induction works, the different kinds of cookware available, and which brands can bring you the best induction cookware for your money. Some cookware will rise above the rest regarding quality and value. Here are today’s top five products. The reviews are in, and this is one of the best induction cookware sets on the market. People love the Cook N Home set for its durability, beauty, and price. Many reviewers were surprised at the quality of this brushed set, considering how little they paid for it. The tempered glass lids make checking on your stew a breeze, and the strong, sturdy handles grace the skillet as well as the pots. It cooks evenly and efficiently, with many satisfied customers pointing out just how low they had to set the temperature, thanks to the efficient induction core. Duxtop SSIB-17 Professional 17 piece Stainless Steel Induction Cookware Set, Impact-bonded Technology. The Duxtop SSIB-17 set wowed reviewers with its beautiful design. It has an aluminum sandwich core and no drip lips on each piece. 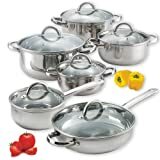 18/10 commercial grade steel and heavy gauge impact-bonded aluminum make these pots and pans lifetime keepers. 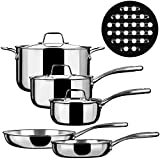 Glass lids and deep sauté pans make batch cooking in these babies a dream for the serious foodie or the casual chef. The Nine piece Duxstop set shines -literally! The polished cookware is so pretty; you’ll want to leave it out on the counter for everyone to see. Boasting Whole-Clad Tri-Ply Stainless Steel construction, it allows even heating not only on the bottom of the pan but up the sides as well. It has a solid aluminum core, and it is both oven and freezer safe. On the road with an induction stove? No problem with Magma Products’ Gourmet Nesting Set. The rising trend among RVs is to include induction stoves for added safety and to keep energy costs low. Now you no longer have to use the same pan over and over for everything you cook in your RV because this ten piece set packs away in just half a cubic foot of space! The triple clad bottoms of these pieces ensure even heating, and each piece has a gorgeous mirror polish and is dishwasher safe. The only setback is that all the pieces share one interchangeable lid which is handy for storage but means you can’t cook more than one lid-requiring dish at a time. Whether you’re looking to replace just one piece in your cookware set or you just want to add to your growing collection, this is the pan for you. 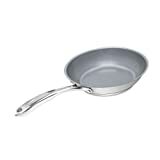 It has a high quality, copper core, no drip sides, and a nonstick ceramic coating that is far more durable than Teflon. The Japanese steel exterior is reinforced with titanium for extra durability. EASY TO CLEAN: Dishwasher safe. 6 Year Guarantee: Backed with a 6 year guaruntee, ELO is completely confident that you will love their product. 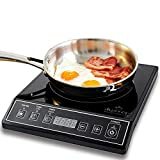 Unlike conventional heating methods, induction cooking uses a magnetic field to transfer energy directly from the electrical current running through the induction cooktop into the pot or pan. This makes for extremely even heat distribution. But what’s way cooler than that is that while the cookware gets hot, the cooktop remains cold! It works like this: In an induction stove, electricity runs through a magnetic coil, producing a magnetic field but no heat. Because induction cookware is magnetized, this magnetic field induces another electrical current in the bottom of the cookware, which generates the heat used to cook the food in the pan (Fun fact: This is similar to what happens on a planetary scale when the electromagnetic pulse from a solar flare creates a major blackout on Earth. Google that if you’re looking for something interesting to read after enjoying a satisfying, induction cooked meal). The electrical current running through the pan can cause the pan to vibrate and buzz softly, but the sound is usually only noticeable in a soundless kitchen. There are lots of different ways to magnetize a pan, and the magnetization method will affect the quality of the cookware and subsequently, the quality of your meal. Because there are many ways to magnetize metal, there a few different types of induction cookware. It’s important to choose the one that is right for you. Here are a few styles of induction cookware. If a metal is naturally magnetic, it will react to a magnetic field, so any cookware made of cast iron or a magnetic stainless steel alloy will work on an induction stove. This can be expensive, but fully magnetic materials make for some of the best cookware for induction stovetop use. Be careful when choosing cookware that is not specifically advertised as suitable for induction stoves. Not all stainless is created equal. Steel is an alloy, which means it is made by mixing two or more metals together. All stainless steel contains iron, which is magnetic, but the combination of other metals in the alloy will affect the magnetic properties. 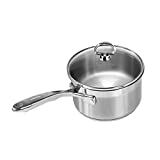 If for example; if a steel pan contains too much nickel it will not work on an induction cook top, because when the nickel bonds to the iron it weakens or in some cases eliminate the iron’s magnetic properties. Sandwich style induction pans are like magnetic bottom layer style pans with the bonus of a distribution core. In a sandwich style induction pan, a layer of heat conductive metal like aluminum or copper is squished between the magnetic bottom and food-touching layers of the pan creating a core that distributes heat more evenly. This counteracts the hot spot effect that can come with a simple magnetic bottom pan. Copper is the premium choice for an induction core, but aluminum works well too. This might be more aptly named the “club sandwich style.” These types of pans are just like the regular sandwich style described above, but instead of a solid core, they contain multiple layers of one or more metals. This may help to distribute heat even more evenly than a solid core sandwich style induction pan, but the difference is negligible. Induction current is the future of cuisine, and everyone wants in on it. All the popular brands have these types of products available. Cuisinart caters to the non-stick crowd, with plenty of ceramic coated induction cookware for their customers to browse. They favor solid aluminum cores and tight glass lids. Kitchenaid kicks things up a notch with copper induction cores. They don’t tend to openly advertise the fact that their cookware is induction ready, but a quick glance at their product descriptions verifies that many of their sets are induction cooking-friendly. If you are shopping for cookware and the name of the product doesn’t specify that it is for use with induction stovetops, always check the description to be sure. Otherwise, you might end up with a pile of pots and pans that just can’t heat up. Duxtop is the kitchen king of gleaming steel. If you prefer to sear, caramelize, or deep fry, then Duxtop’s original, non-non-stick sets are the way to go. There are lots of advantages to using pans that do not have non-stick properties. They do tend to last longer as there is no coating to scratch, and some recipes specifically require that the pan gets a little sticky. Plus the shiny glint of real steel adds a professional look to your kitchen. Food is life. It is our fuel, giving energy to every last one of our cellular processes including respiration, growth, skin regeneration, healing, and even our thoughts. Nearly everything we eat passes through our kitchen and the tools we use in it. We use our cookware every day for almost every meal, so investing in the right set is crucial, and will pay off down the road. Choosing the best cookware for your induction stove is not a task to be taken lightly. It is important to weigh your options and discover which features are going to take top priority in your kitchen. Ask yourself about the kinds of food you prepare. Do you do more frying or more sautéing? Do you simmer long, savory soups and stews or do you lock in flavors with an intense sear? Do you like to adventure in your kitchen, trying out every new recipe you come across? The answers to these questions will steer you towards the right induction cookware for you. If you favor the savor, you may want to stay away from non-stick, as it will prevent you from getting that deep, golden, caramel brown that makes onion soup so perfect on a winter night. But if you like quick breakfasts and almost unburnable grilled cheese, then non-stick may be your destined path. Of course, you can always skip buying any one full set and opt instead to mix and match from different product lines to give yourself a little bit of everything. What is “best” really comes down to you. Induction cooking is an exciting new kitchen development that reduces energy loss, allows for exact precision, and distributes heat more evenly than ever. But it also requires a particular type of cookware. With so many popular brands making and selling induction cookware, there are many different options available for you to choose from. The best induction cookware is different for every kitchen, but with a little research, thought, and care, it’s easy to find the magnetized pots and pans of your dreams.